The Flying Deuces. Boris Morros Productions 1939. This is the only film I hadn’t heard of when planning this series, but I wanted a Laurel and Hardy. Well, I wanted a Buster Keaton and a Harold Lloyd, but suitable Keaton and Lloyd films weren’t available to me. Anyway, I wanted something fun to follow last week. I’ll close the month on a serious film. So, Laurel and Hardy in the Foreign Legion. Comedy ensues, of course. Having so little go go on, I have a hard time conveying how much I’m looking forward to it. I expect a lot of schemes to getout of the Foreign Legion. Coming to the end of their vacation in Paris, Ollie has fallen in love with Georgette, the daughter of the inkeeper of the place they’ve been staying. What he doesn’t know is that she’s married to a Legionnaire, Francois. When Ollie proposes to Georgette and she tells him there’s another man, he decides to drown himself and Stan in the Seine, but Francois happens upon them and convinces them to join the Foreign Legion to forget his heartbreak instead. Of course, Legionnaire life doesn’t agree with them and they pack up and walk out, which just as inevitably leads to an order for their execution as deserters. I find it rather unfortunate that the title fixates on the final sequence, causing it to be rather misleading. I was more or less expecting hijinks in the air over Africa during WWII. Not entirely, but one or two combat skirmishes. The story is, by nature, there so they can do comic sequences, but I found myself slightly more interested in the Georgette situation than in the Legion. It has a structure rather like an episode of The Simpsons, in that it starts with one situation that somehow leads to an entirely different situation that forms the bulk of the episode, with optional later callbacks to the catalyst. The best part of a Simpsons episode is the opening, which has the freedom to be more random, and the same is true here. The best comic scenes to me were the sequence with the low ceiling and the sequence at the river. At first, I felt the duo’s acting was rather stiff. Their line deliveries in the earliest scenes were stilted, like they were acting out acting the scene. That dissolved soon enough, though, and I didn’t have complaints by the time they joined the Legion. Of the humor, I think I enjoyed the slapstick most. Some of the farce seemed to be telegraphed ridiculously, but that’s probably because jokes like those are well established now. I hope there was a time when “we’ve been tunneling forever, we must be outside the wall by now” didn’t immediately mean they were going to surface in the worst possible place. Ultimately, this film was fun, but a disappointment. The pair can do a lot with wordplay, but the funniest Laurel and Hardy stuff I’ve seen is silent. Watch this film: for a few laughs about army life. Don’t watch this film: for a compellingly funny story about aerial combat. I can’t say that I agree with your review, though I do respect it. 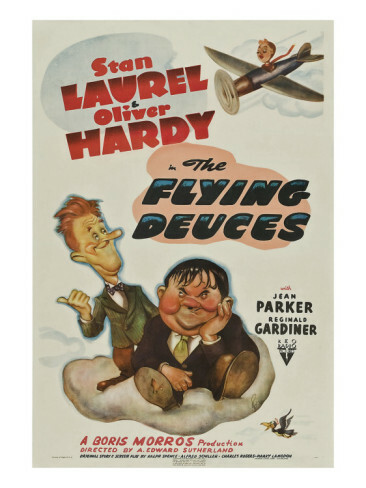 By the way, for anyone who might be interested, on June 12, Legend Films is releasing a Colorized/Black & White combo of “The Flying Deuces,” which is now available for preorder at Amazon. It promises to be the best release of it yet and should replace the many fair to abysmal Public Domain prints the world has been treated to for many years!